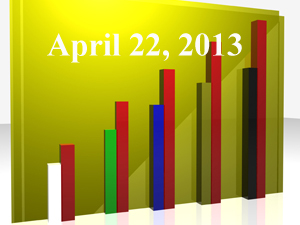 “The 2 Least Understood Investment Rules that Most Hurt 401k Investors,” (FiduciaryNews.com, April 16, 2013). Why do so many common sense notions fail to work in the investment world? Far, far away in a distant galaxy, a rebel alliance takes up its struggle against the dominant emperor and his minion army. Of less interest, but no less significance, a beleaguered and divided industry finally combines forces to fight the single common enemy who seeks to harm the long-term goodwill and self-sustainability of the everyday investor. “Limiting 401k tax advantage is unwise,” (InvestmentNews, April 14, 2013) Two words: Collateral Damage. “Obama budget to cap retirement deductions,” (Pensions & Investments, April 15, 2013) For those who missed the news when it originally came out last week, here’s P&I’s summary review. Nothing’s changed. It’ll make you just as mad as it did last week. “Retirement savings cap would hurt small businesses, workers,” (BenefitsPro, April 15, 2013) The author believes the law of unintended consequences means Obama’s budget, if approved, may lead to the end of the 401k. The author needs to reconsider whether this is what is actually intended. “Tax Incentives Benefit Most Retirement Plan Participants,” (PLANSPONSOR.com, April 19, 2013) Well, ain’t this interestin’? It appears 71% of those taking advantage of retirement plan tax breaks earn less than $150K per year. Bet they didn’t know they were part of the evil “rich”? It’s been a long time coming but it looks like we’re going to see a showdown this summer. We can almost hear the strains of Tex Ritter just thinking about it. Is Phyllis Borzi being fitted for the Grace Kelly part? “401k rollover study triggers call for action,” (Pensions & Investments, April 15, 2013) Could it be that the marginally controversial GAO report is the straw that breaks the camel’s back and tilts regulators towards a uniform fiduciary standard and a new ERISA fiduciary rule? “SEC, DOL Must Collaborate on ‘Overlapping’ IRA Fiduciary Standards: Attorney Mason,” (AdvisorOne, April 15, 2013) Mason works for the lobbyists. ‘nuf said. But the article does us the service of also quoting David Tittsworth, executive director of the Investment Adviser Association, who is definitely not working for the lobbyists. He offers a convincing counter to Mason. “When Disclosures Do More Harm Than Good to the Client,” (AdvisorOne, April 17, 2013) Bob Clark discusses a paper by Michael Finke that reiterates why disclosure is doomed to failure. It’s a good overview for those not familiar with the problems associated with relying on disclosure. “Your ‘fiduciary IRA’ opportunity – an FAQ,” (BenefitsPro, April 18, 2013) If the DOL rules as many expect (and many investors hope for), this is the kind of article you’ll be seeing a lot of. “Fiduciary Standard Debate Expected to Heat Up This Summer,” (On Wall Street, April 19, 2013) Figure the DOL to come to the plate first as early as July, despite heated lobbying by industry groups to prevent the agency from protecting retirement investors. Next comes the SEC and perhaps a limitation on the use of the term “advisor” to fiduciaries only, (the term “adviser” is already limited to fiduciaries). Is the silence a testament to the futility of it all? Or merely tacit admission that, after all the hype, nobody cares? Or could it be the calm before the storm? The great thing about investing is that it goes in cycles. This means one very important thing, as long as you keep saying the same thing all the time, you’re guaranteed to be right two-times per cycle. And when things return to the old normal, it gets easier to be right. Good Job! “Value vs. Growth: Which Investing Strategy Is Better?” (Financial Planning, April 1, 2013) Here’s a refreshing article that represents old school thinking – and we mean that as a compliment. Before there was Modern Portfolio Theory to make things harder than they needed to be, there was this simple question: Value or Growth? The results of this study confirm what previous studies have said, but do so in the context of index fund investing, which may provide some clarity on when active beats passive and vice versa. “DC plans better prepared for downturns,” (Pensions & Investments, April 15, 2013) But only because they risk meeting long-term investment goals. Of course, you’d have to read between the lines to discern that reality from this otherwise rosy article. The piece celebrates the move from equities to target date funds without mentioning it was the target date funds themselves that offered the worse performance in the most recent downturn. The author also fails to mention how across-the-board the 2008/09 debacle was, with “alternative” investments bearing the brunt of the precipitous drop. Of course, claims the article, those very alternative investments are in part helping DC plans be better prepared for downturns. What alternative universe is this written in? “Why ‘safety’ should be last for 401k investors,” (BenefitsPro, April 18, 2013) Here’s the must read article for everyone concerned that 401k investors are too cautious in their investments.